If you have any questions or want to enquire about dates, use our form to contact Luisa Riddiford or see their website for more information. 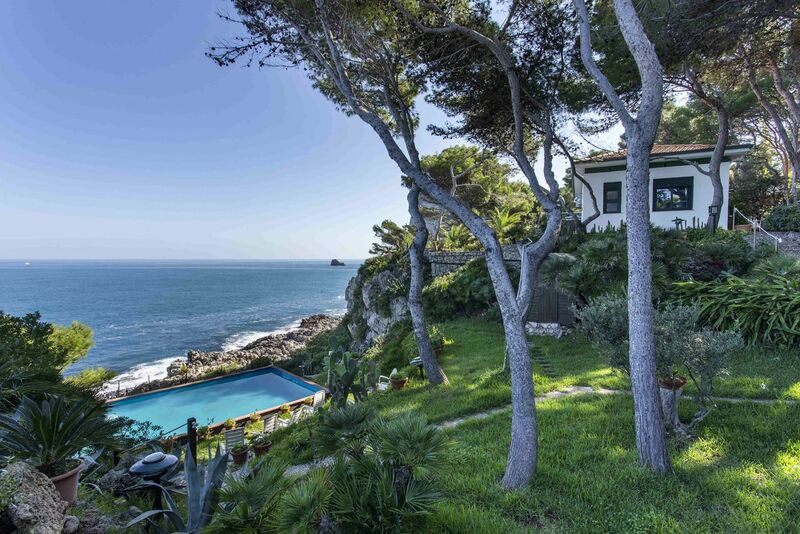 The drive up is exciting and fun, the views when you get here stupendous: a panorama that reaches to the Leaning Tower and to the Mediterranean on the horizon. Sitting on the southern slopes of Monti Pisani are a group of farm buildings immaculately restored, served by spring water and powered by solar panels. Musicians Luisa and Colin live on site, love people, love the place, and take care of everything. The two, independent, farmhouses stand side by side (ideal for friends), with living spaces on the ground floor, bedrooms up, and a big wide stone terrace at the front with curtained-off pergolas. There’s a terraced olive grove for exploratory romps – or naps in the shade – and a decked and fenced infinity pool with an outdoor shower. All you hear are the birds and the wind. As for the farmhouses: they’re functional, spotless, family-friendly and furnished in traditional style, with fireplaces for winter stays, repro art on the walls, and toys. You get a restaurant at the bottom of the hill, a food shop a six-minute drive, jazz in Lucca, guided rafting on the Serchio, and the Parco di Pinocchio in Collodi – child heaven. Special offer: We've a last minute get away to almost give away ! 27th April - 1st May - a 4 night stay for just €500. It's a bargain and the place is exceptional. Go on - get away from that island !! Minimum stay: 3 nights. 3 nights on weekdays. 3 nights at weekends. 5 nights in high season. We very enjoyed our 2 weeks stay at La Lucertola guest house. The view and surroundings are just perfect if you want to switch off for a while. The pool is great and the house is simple but tastefully decorated. Luisa and Colin were great hosts. They were on the site but gave their guests a lot of space to be by themselves. Lots of great food delis locally. The only flaw is the drive up - but it is totally worth the effort for the amazing view. We had restaurant at home organised by the hosts which was delicious. Do try their olive oil! What a lovely place! We had such a great holiday. 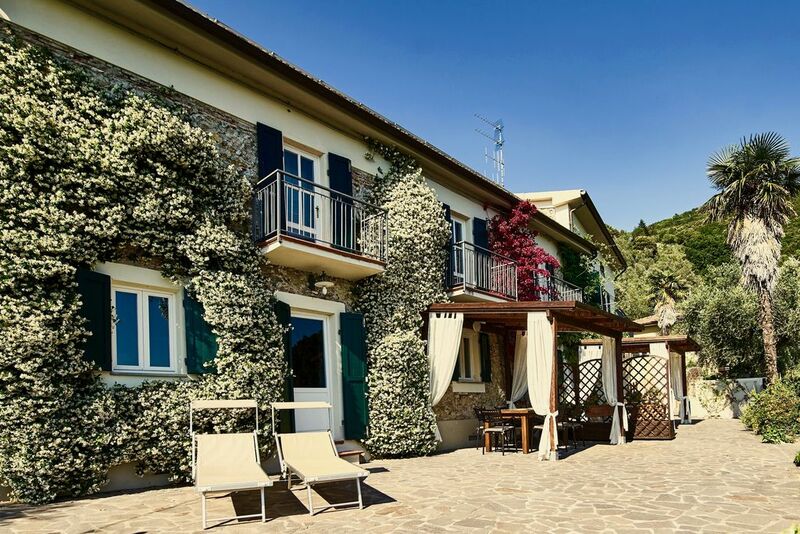 The house is in such a wonderful setting, set high amongst olive trees and overlooking Pisa. Happiness is sitting on the balcony in the evening drinking a cup of tea. The children were delighted with having a pool in their back garden. Colin and Luisa are welcoming and friendly hosts. I would definitely recommend this special place. We stayed in house no 1 & were delighted with our choice. Beautifully nestled on a hillside, amazing views across the countryside & leaning tower of Pisa in the distance. House spotlessly clean-home from home plenty big enough for our 5. Challenging drive up mountain but well worth it! Relaxed under the pergola, sunbathing or by the pool. Wifi 5*-coped easily with iPads,iPhones and laptop! Easy reach of Lucca/Pisa/Florence by train or car. A magical stay with excellent hosts-there to help but not intrusive. Exceptional value and highly recommended-you will not be disappointed! We rented the house for our first vacation in Tuscany. The house was exactly what we had expected - from the owners' description as well as the reviews. The drive up was a little nerve breaking, but it totally worth it once you get on top of the hill. The view is to die for - absolutely amazing! Luisa and Colin are very friendly hosts. We felt absolute privacy while staying at the guest house. The house was very clean and well equipped. We had everything we needed. It is about 20 min drive from the Tower in Pisa, 20 min drive to the center of Lucca and 30 min from the beach. We loved it! Unique and stunning views of The Leaning Tower of Pisa.. Panoramic and inspiring views over our lovingly tended olive grove, forest, fields, villages, Pisa in the midground, the Mediterranean Sea in the distance - spectacular. Great hillside walks on site. The natural spring water salt swimming pool is set in a truly amazing location with views to infinity over valley field Pisa and Med. The pool zone also boasts a unique shower which pours out water from the trunk of an ancient olive tree - simply fabulous. Our own organic olive oil for sale - buy it and try it on your very own home made pizzas using an original wood fired pizza oven. Try our allotment for toms, peppers,salad and herbs to create your perfect pizza. Peaches, pears, figs and cherries in season. From right outside your door enjoy some of the best walking trails imaginable. Truly great walking on hand, offering views over Pisa, Lucca, The Mediterranean. Enjoy walking through wonderful chestnut stands, pine forest and olive groves - inspiring! Restaurant At Home: We have great friends who are excellent chefs and offer a bespoke service - they come to you and prepare a real Tuscan banquet in the wood fired oven - fish, meat or vegetarian - it's a winner ! Also load up on some Tuscan cooking tips! Great activities for all ! rafting on the nearby rivers, cycling trails - bike hire from nearby Lucca, paragliding right over our hills, great beaches - wonderful snorkeling not far away, fishing - sea or river, Lucca wine tours, chefs at home - just ask! !